While taxiing N552TC struck taxiing N976SP. While taxiing to parking N976SP was struck by taxiing N552TC. 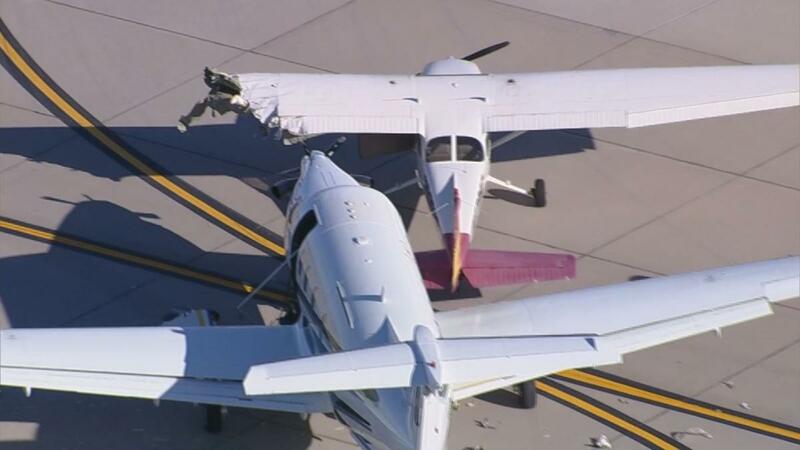 Two small planes collided Wednesday morning at Phoenix-Mesa Gateway Airport, officials said. 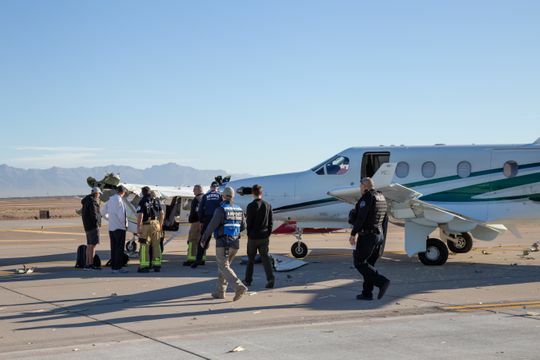 Two general aviation aircraft were involved in the incident at the airport near Ray and Power roads in Mesa, just before 9:40 a.m., said Ryan Smith, a spokesman for the Phoenix-Mesa Gateway Airport. No injuries or fires of any kind were reported, Smith said. The collision left debris scattered over the runway. The wing of one of the small planes was partially cut off and lying on the ground while the propellers of the other were broken and missing. The larger of the two planes, a Pilatus PC-12/45, a single-engine turboprop passenger and cargo aircraft, is registered to Daylight Nightlight EZ Flight LLC, a Scottsdale-based company. 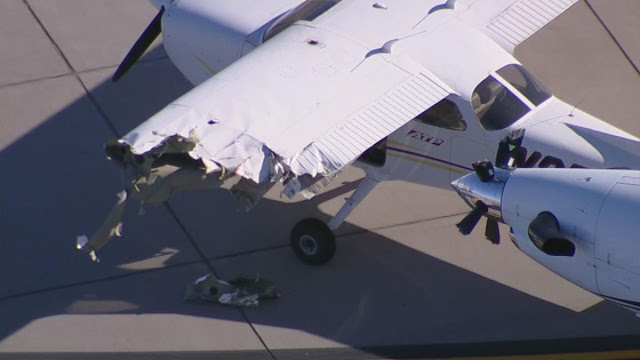 MESA, AZ (3TV/CBS 5) -- No injuries were reported after two planes collided at Mesa-Gateway Airport Wednesday morning. According to Deputy Chief Forrest Smith with Mesa Fire and Medical, two small planes struck each other on the runway just before 9 a.m. There were seven people on board both planes and luckily no one was injured. It will be interesting to see this accident diagramed. There is no way it could have happened the way the planes are positioned now. The right wing of the Pilatus would have crushed the Cessna’s tail for the propeller to reach the left wing. If it was a head on, then the right wing would have got munched. Let the paperwork begin. That incident was unfortunate but could have been much worse. Yikes! 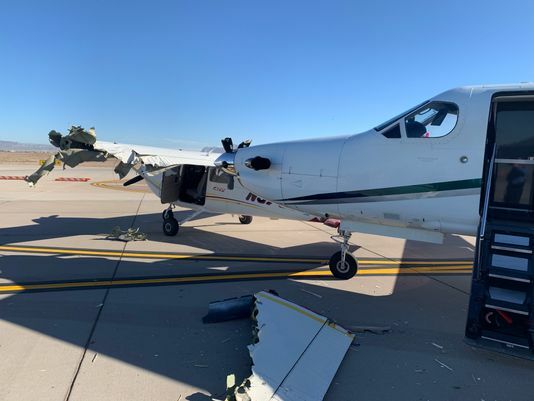 It's a good thing Cessna has the wing fuel tanks located close to the fuselage otherwise when that whopper-chopper tore into the wing there would have been one giant explosion when the tank was breached. Glad no one was hurt and the Cessna can get another wing. That is NOT going to buff out! Honestly ... The Cessna backed into us. The words "Maricopa County, Arizona" keep a frequent appearance in Kathryn's Report. How does this happen? I do not think the C-172 was rolling backwards. I could be wrong though. This was my first USAF duty station. Williams AFB (KCHD) was an Air Training Command UPT facility, hosting advanced pilot training students learning to fly T-37 and T-38 aircraft. There were also Saudi Arabian and Iranian maintenance personnel and pilots training to fly the F-5, with a TAC training unit equipped with Freedom Fighters. On any given weekday, the skies over Williams AFB looked like a beehive. Good point, Anonymous. Hmm....Well, if the propeller on the Pilatus rotates clockwise from the cockpit, the force of that collision would cause the Cessna to rotate clockwise from the point of impact, with the tail (Horizontal Stabilizer) of the Cessna impeding further rotation by impacting the Pilatus. How's that for a SWAG? Anonymous, good point. Hmm, let's see....If the propeller on the Pilatus rotates clockwise from the cockpit perspective, the force of the collision would rotate the Cessna clockwise, with the Cessna Horizontal Stabilizer halting that rotation by colliding with the Pilatus fuselage. How's that for a SWAG? I believe the 172 was suppose to take a right turn at Albuquerque. Obviously he didn't. "The light was green, officer." Somebody is at fault, no question about that. I don't think icing was causal. Do you know that Maricopa County is LARGER than 4 states ? It is 9,200 square miles, with 10 airports of which 4 have major pilot training programs each with a average of 400 students a year. The county has probably 4 million people in it and includes Phoenix and Phoenix Airport. So I suppose you are not gonna fly into Phoenix anymore? Yes, I will stay away. Despite your pride and you are welcome to have it I have no business there and I suspect you will be pleased if I do. Win/Win - we should all be happy. The Non-Movement area at Mesa is so big and such a maze, I wonder where on the airport the incident occurred.